Clara Nostra (cla-ruh nose-truh) began life as Clarinots (cla-ruh knots), a 30 minute work for 106,476 clarinets originally released on the Sound of Pig cassette Horn & Hard Arts (SOP 197). You may ask yourself “106,476 clarinets?” And you would be right to do so. The original recording of 4 separate clarinet tracks was bounced back and forth between the 4 track, an 8 track and a 2 track, slowed up, speeded up and generally bounced and rebounced so that the end result technically should have, yup, 106,476 clarinets (see insert score). (This) is a re-issue of an already obscure piece. Really a re-issue, when it only comprises ninety-nine copies? Literally, yes. But unfortunately we fear not enough eager listeners will have the chance to hear this frankly remarkable half-hour drone somehow created out of the mouths of four clarinets tracked separately and then looped and re-looped 106,476 times, according to its creator, Al Margolis. Perfect for when the lights go out and you can´t turn them back on. Nor wish to. Here’s a stimulating substance for the serious cultists of psyche-affecting drones, just in case it was missed the first time (which would show that they’re not so serious after all). “Clara Nostra” – originally published in 1999 on Pogus, was entirely prepared with manipulated tapes saturated with clarinets, which were superimposed and bounced in hundreds of ping-ponging tracks until a (demonstrable) total of 106.476 was reached. Astronomical figures aside, this is purely and simply one of the best low-frequency albums ever made. A massive monolith comprising barely traceable movements in mammoth subsonic stasis, which is what distances this music from the “press a single key, feed the Lexicon and go eat something” shallowness of the 98% of today’s releases in this area (yes, I’m getting repetitive, but am not going to stop anytime soon). Put this in your player, set the volume to a decent level and feel the air flooded by quivering liquids, the heartbeat and the breathing rhythms slowing down, the consciousness dilating (… and several loose parts in the room trembling). This thing is also extremely helpful against external noises, therefore you can consider it a means of positive isolation (nothing beats Klaus Wiese’s “Space” in that sense, though: if plagued by, say, the neighbour’s son’s racket, use that CD in infinite repeat for absolute cerebral ecstasy and utter destruction of any extraneous egotistical behaviour). With this magnificent record, Al Margolis arrived very close to that height. Lots of kudos to Echomusic for bringing it back from the depths of memory, if only in a 99-copy extra-limited edition. 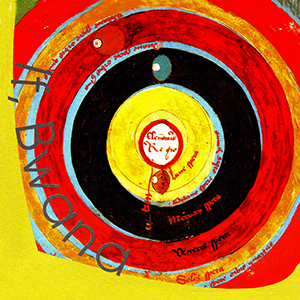 “Clara Nostra” by If, Bwana on Echomusic is a re-issue, reviewed in Vital Weekly 202, and back then we wrote: “The process that underlies this work is very simple and very old. It was a combination of Steve Reich’s Phase Shifting and Alvin Lucier’s “I’m Sitting In A Room” technique. You take a recorded sound and place it on a multi-track, on each track the same thing. If all the tracks are filled, you mix it to the first track again and start filling it up again. And again. Again. Until you have, say, 106.476 times the same sound. A thick massive layered sound. In between you can slow it down (although ‘delay is a cheap drug’ as Steve Reich once said), to make it even more fat, more thick. That’s the idea behind this new If, Bwana CD. Simple, direct and well executed. Much like Palestine’s recent CD on New World, although the main difference is that Palestine is not into the cheap drug and Mr Bwana is. Me, of course, I don’t care about slowing a tape down. Who cares anyway how it was made. The result is what counts. And that is a very nice one this time. Massive, slow changed, a beast turns around. Play this one before the A Produce/Griffin one mentioned elsewhere and you have a long contemplated night”. That still holds up after ten long years. If, Bwana at its best.